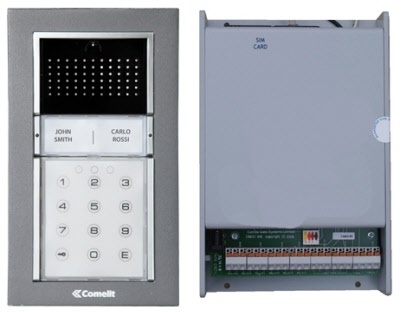 GSM Wireless Intercom with keypad - Control your electric gates from your home or mobile phone! Why use a GSM intercom ? There are no cables to run externally or internally so saving on both cable and excavation/redecorating costs. Many conventional wireless intercoms can perform badly and have limited range. GSMCOM’s range is literally global! The GSM electric gate intercom allows you to control your gates and attend to callers from anywhere with a mobile phone signal. The system can be used to control gate access to one or more properties and can (if you choose) automatically dial a second number if the first is not reachable. Relays can be used to open the electric gates, doors, turn on lighting etc. and are controlled by the normal number buttons on your handset. You can also call in to the system to allow you to allow communicate and operation of your electric gates etc. The system will accept instructions by text message and this feature can be used for to hold the gates open for example. (assuming your automatic gates control panel has a gate hold facility!) Another text message would then be sent to close the gate. How does the system work?When a visitor presses the button on the GSMCOM intercom it uses the standard GSM network to make a call to the programmed number(s) You can then communicate with the gate or door and allow access by pressing a number on your mobile phone keypad. The system comes complete with the Comelit IKALL Powercode call unit and the control unit in an IP rated weatherproof enclosure to be mounted behind the gates. An antenna is included with the GSM intercom system.